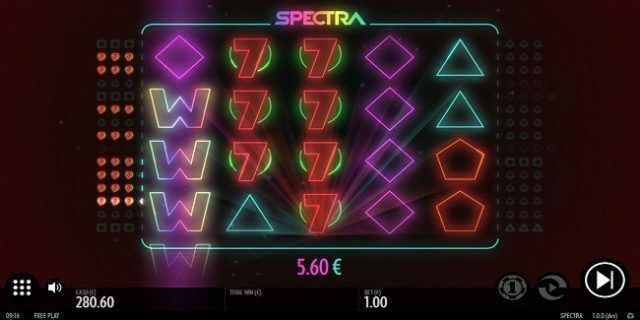 Spectra is a mobile slot game of 5 reels and 30 paylines powered by ThunderKick software platform. This beautiful slot can be played via mobile, smart phones as well as on Desktop. You can play this slot at any ThunderKick Online Casinos for free or for real money. This slot is inspired by neon lightings. This slot contains feature symbols such as blue triangle, golden bells, blue circles and green squares. This slot is being set against a black backdrop/background. The slot offers a jackpot as well and returns of player percentage for this game are 96.4%. Minimum coin size for the game can be 0.1 per spin, however maximum coins size can be 100 per spin. The option “Coin” is used to Ste the coin size, ‘Auto Play” is used to set the reels in motion without interruption for a chosen number of times and “spin” option is used to starts the game. The game also includes wild symbol. The letter ‘W’ acts as the wild symbol in this game which can replace any regular symbol and will form winning combination. The wild symbol covers 4 regular symbols usually. There is a re-spin feature available in this game which can be triggered when one or more wild symbol occurs on active reels. The top prize for this game can be as much as 240,000. Just because this Spectra slot is basic, doesn’t necessarily mean it’s boring and not worth playing. Yes there’s no free spins or bonus games as such, but the wilds will steal the show with a top prize of up to 240,000 cash. Spectra mobile slot also includes a Wild Nudge feature as well. This feature gets activated after wild respin which nudge up to down 1 symbol to provide bigger wins and of course another respin.